I fangirl over a lot of things. Sprinkles Cupcakes, for instance. Jamie Fraser in a kilt. The four sacred Hollywood Chrises. 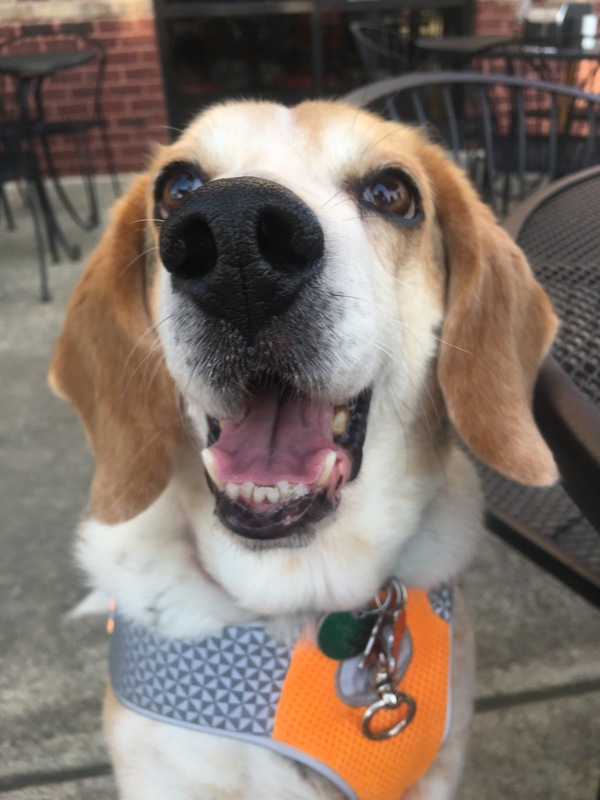 My beagle on a random Monday afternoon when he gives me this look and makes me putty in his paws. Bottom line, when I love something, I go all in, and if you’ve been reading this blog for a while, you’ll know that when it comes to fiction, I am a no-holds-barred, super-mega-ultra fangirl of Beatriz Williams. (Yes, that is the technical term, thank you very much.) Every time she releases a new book, I devour it with complete fervor and tell everyone I come in contact with that they must, must read it. Today, I’m going to gush about her latest novel, Cocoa Beach. Surprise! You must, must read it. Cocoa Beach takes us on a journey with Virginia Fitzwilliam (née Fortescue), who fans will remember as a secondary character in A Certain Age. In 1917, the young Virginia is working in northern France as an ambulance driver for the Red Cross when she meets charismatic British army surgeon Simon Fitzwilliam. Running from her traumatic childhood and rigid New York upbringing, Virginia finds solace in the makeshift war hospital and in Simon’s arms, despite the tragedy surrounding them and the hidden complications Simon brings to their relationship—and eventual marriage—at every corner. In 1922, the newly widowed Virginia travels to Cocoa Beach, Florida with her young daughter, looking for answers in her estranged husband’s mysterious death and in search of the man Simon really was. Welcomed by Simon’s brother and sister, Virginia finds herself in an entirely new world filled with rum-runners, orange blossoms, and even more family secrets than she imagined. As things take a dangerous turn, Virginia struggles to grasp what’s real and who she can trust, while doing everything she can to protect the one person who matters most: her daughter. Once I got sucked into this book, there was honestly nothing I could think about doing until I finished. Just like Virginia, I had no idea who to believe and what truths were lying in wait in the next chapters. (At one point, I even shrieked, “WHAT!” Fortunately, no one was around to witness this except for my four-legged secret keeper.) As with Williams’ other narrators, Virginia’s voice hooked me from the very first line, and I was completely caught up in every inch of her tale. At every page, I had an entirely new theory on what was happening underneath, and at every page, I was completely, heart-in-my-throat surprised. Cocoa Beach checks off everything I love about a Beatriz Williams book—a fiercely strong and unique protagonist, pulse-stopping romance, a setting I can almost smell and touch—and the added element of dark mystery woven throughout makes this another novel I will never forget. Usually, I give the spiel that while the characters have ties to previous books, this is a stand-alone novel and can be read on its own. That’s still true, but I strongly recommend that you to read both A Certain Age and The Wicked City before picking this one up. Trust me, you’ll get so much more out of it and will see it on an even deeper level if you do. Plus, they’re all phenomenal books, so why wouldn’t you read them? 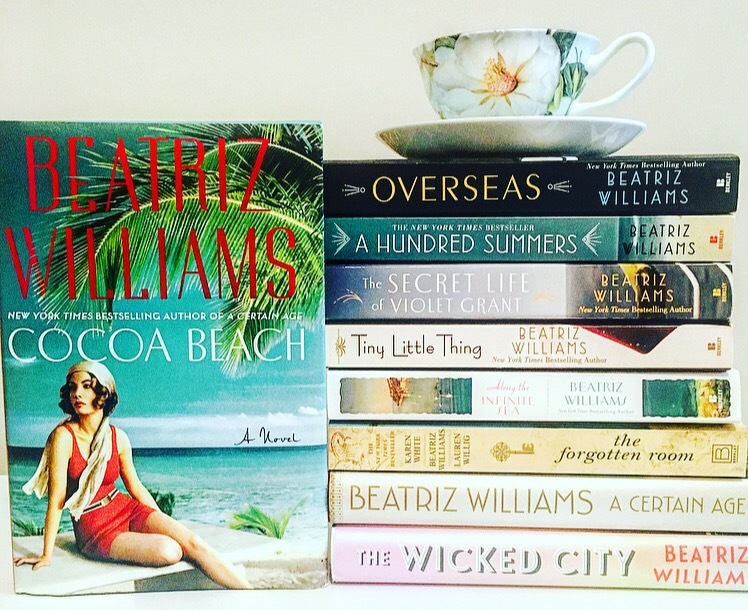 Fellow Beatriz Williams fans, you know as well as I do that your summer won’t be complete without reading Cocoa Beach. If you’ve never read one of her books, I cannot stress this enough: YOU ARE MISSING OUT. Every single one of her novels is impossible to put down, and once you pick one up, you’ll be plowing through all of them in a matter of weeks. I know of what I speak, friends. Fangirls always do. For more on Beatriz Williams and her can’t-be-missed novels, visit beatrizwilliams.com and follow her on Facebook, Twitter, and Instagram. Also a huge Beatriz Williams fan– I think A Hundred Summer was my first and then I couldn’t get enough! It pains me that I haven’t read Cocoa Beach yet– my library waitlist has been super long, so I guess other people are catching onto her awesomeness now too! I LOVE A Hundred Summers!!! Oh, that Nick Greenwald… 😍 I hope you get to read Cocoa Beach soon! I love historical fiction, but have never read a book by Beatriz Williams. If you could recommend one book what would it be? I’d love to try one of her books out. Honestly, they’re all good so you really can’t go wrong! I usually recommend starting with A Hundred Summers because it’s a great stand-alone novel. If you love that one, jump into the Schuyler sisters trilogy and you’ll be hooked! I hope you enjoy!! Done! I added A Hundred Summers to my TBR list. I’m always on the hunt for fabulous new authors. Yay! I hope you enjoy it, Tina! !